From Part I, I have only established a connection with local MySQL. Next Iâ€™ll show how to retrieve and modify data on remote MySQL. To get some data, I need to execute query on the MySQL and get the result back to me. First, I create stmt (Statement object) and execute query in SQL language. Then I store the result on ResultSet object and iterative show the result on the output window. – Statement objects allow you to execute basic SQL queries and retrieve the results through the ResultSet class. – In while-loop, iterative in the ResultSet object to show result in console (ProductName and UnitPrice columns in Products table) on output window. Note: I have imported only 4 records from Products table in Northwind database. 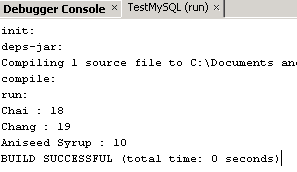 You can download source code example testMySQL.java (Right-click on the link and select Save target Asâ€¦). Thanks a lot! That is exactly what I needed to get jump-started on Java & MySQL. You have no idea how hard it is to find a simple explanation like this. why i cannot build because of the con. who can help me !? I think that you haven’t completed part1: create a connection yet. You need to create a connection to MySQL before performing any query. Try to read part1 first. This means that you haven’t declare a variable ‘aaa’ before using it. According to your problem, have you already declare all of variables? Try check stmt and connectionUrl. In my example above, I have declare stmt = null and connectionUrl = “jdbc:mysql…..”. @Arnaud: You have to put the code of this part inside the scope of the “try” command from Part I. If you place the code outside, then the compiler doesn’t see the declaration for the Connection con. Thanks Dory, that was the answer to my problem. As I said very new to java programming. Sorry that was very basic. By the way anybody knows where I could find a tutorial to then bind this query (INNER JOIN through more than 1 table) to a JTable? The NetBeans tutorials only shows how to bind a simple table to a JTable, which is not very usefull as most of my tables contains ID’s we are of no meaning to the interface use. It’s great!!! I was trying to find out a place to start JAVA MYSQL connection and found no where. All the writers assume that only professionals have the right to read their articles. Thanks a lot for the simple but great and effective article. How to insert, update and delete if we use has map method? Can you explain about it??? What do you means “map method”? can you enlighten me here? THANKS! solved it 🙂 some how the “:port/” part of the conn string was causing troubles. you’ve saved me loads of time! muchas gracias por la demostraciÃ³n. I want to retrieve data from the table with the following code but instead I get nothing. Is there any error message? First, you should try to test if the SQL query’s syntax is correct by print out the query to console window and copy it to run on the SQL Server. I followed ur instruction step by step.. it successfully build but fail to run..
SQL Exception: com.mysql.jdbc.exceptions.jdbc4.CommunicationsException: Communications link failure. The last packet sent successfully to the server was 0ms ago. The driver has not received any packets from the server. Why is this so? What should I check in this case? Check if the MySQL is accepting the connection from your application. Or if there is any firewall blocking. First, I thought that your MySQL is on remote machine. So if it on the local machine, I suggest you to change the connection string “localhost” to your real ip address of the machine. Also, have you forgot username and password on the connection string? hey the records are getting inserted in table properly,but when i am trying to retrieve a single row i am getting a blank page. when i retrieve da whole table it is retrieving… but for one particular row it is not…. when i enter student roll number i am supposed to get student name,father’s name,address and contact no in the same page inside the textboxes. I suggest you print out your query on output window and copy it to run on SQL Server directly to see if there is any error or not. hey i tried in other system ,its working perfectly but i dont know wat’s da error…. the program runs fine the Problem: is Where does the actual physical data of the mysql table is stored. I can locate the .frm files of the table but there needs to be an .Myd file also where does it get stored?? Linglom, you really did well with the way you explained this. I was able to even apply it to my JApplet in Netbeans and the part where I had to add MySQL Driver to the library made the difference. I’d thought of using this information for my Java web development in Netbeans, but although the applet was running without any error, I kept getting a “ClassNotFoundException” error message. Please, give your counsel. Thank you. was made never got executed. Just explaining better… Thank you. THnX a LOT MAn…..REalLY HelPFUl …….. It is simple and superb! Thanks a lot for this. It was simple highly useful. Just like all the previous Posts…THANK YOU!!! Took a lot of stress of my shoulders!! hi! can u send me a simple login program in jsp with mysql with validations and login failed msg if given wrong username and password.im able to establish a connection string but it goes to the next page even when i give wrong user name and password though i ve created a user table with username and password data. thank you !!! hey! i need to write a query to delete a record in the mysql table using java. can u please tell me if theres an error or if there s somethin i need to add? Thank you. this tutorial is useful. thanks a lot. Thanks very much it has been very helpful for me… Love YOU!!!! hey! i want to know the syntax if we have to retrive the data from table for a particular record. i m using netbeans for desktop app,in my app i entered value in field and after click on a button the required data is found. i m making app of employee record. means dat when i entered the emp_id then particular data of employee is found………. what should i write in blank? I have read several just right stuff here. Definitely worth bookmarking for revisiting. I surprise how a lot effort you put to create the sort of excellent informative site. I have xampp mysql DB set on my pc. I want to perform ETL on a table from different machine. How can this be achieved ? Please put some light on this. C:\Users\VOXsaga\Documents\NetBeansProjects\ebay\nbproject\build-impl.xml:245: Compile failed; see the compiler error output for details. Please help me to remove this error. I wan’t to insert the data into it in a single click. @Sahil : What error are you getting and on which line ? Sorry about saying but when i put that my all code is showing error. Firstly, where are you writing this code, is it eclipse or netbeans or other. and when you say u r getting errors do post the errors also. For that i made a new database and a new project in netbeans. C:\Users\VOXsaga\Documents\NetBeansProjects\try\nbproject\build-impl.xml:245: Compile failed; see the compiler error output for details. Just write a simple java program which shows entries from a table in DB without the GUI. And then include the code in GUI based program. U can use this code to try out as said earlier. can you give it according to my frame. cause i am weak in netbeans. The code given by you is showing error in my project ‘try’ which i had commented earlier. just create a new java file named “select.java” and paste the above code in it. Also make the changes in code for the one’s in CAPITAL. i.e. : TABLE-NAME :- Enter the table from which you want to retrieve details and DB-NAME :- whichever database the above table lies in. How to insert records in the button click event? i have already established the connection in the main method.